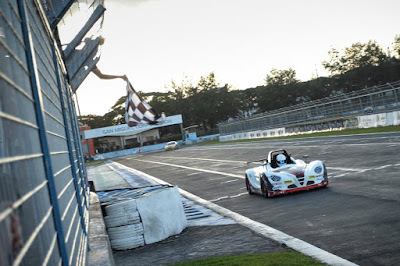 The Oras ng Pilipinas shattered records when the 2017 edition of the country’s longest endurance race got the green light last December 3. It saw a total of 114 drivers, with 31 cars running on GT Radial SX2 tires, competing in 6 categories take to the starting line making it the biggest grid in its history. In the end, the #6 TRS Formula V1 also set a new milestone by covering 800 kilometers (191 laps) around the Clark International Speedway (CIS) to take the overall win. The lone prototype entry missed out on pole during qualifying to end up in P2. That prestige went to the #5 SmartFuels2Race Honda Civic where Jimmy Vernon set a 2:15.307 best. Under the watchful eye of the Automobile Association Philippines (AAP), the race officially got underway at exactly 8:40 AM on Sunday. The field of RP, FM-1, FM-2, FM-3, Manufacturer’s Cup, and Formula cars then began their grueling 8-hour Philippine Endurance Challenge (PEC). SmartFuels2Race went flat out from the get-go and recorded the fastest lap of the race on the very first hour. Their lead, however, was short-lived by mechanical problems that forced them to spend most of the day in the garage for repairs. This saw the #19 Team Shell Helix - Big Chill, #1 Centrum Fuel - GT Radial, and its sister #25 Honda Civic trade places up front in the first half of the enduro. Pit stop strategies also played a crucial role in gaining or losing track position. Teams were required to remain stationary for 2 full minutes to do a driver change and refuel, while only 2 mechanics were allowed to work on the car. With strict rules on safety, any errors were swiftly handled with a penalty. Notable in this year’s event were the number of female drivers. Emily Duggan and celebrity racer Gaby Dela Merced mixed it up with the boys, while Katherine Cañete finally stepped up to the full 8 hours after competing in the 4 Oras ng Pilipinas in June. Then there’s AAP Motorsport Development Program (MSDP) graduate Hazel Ramirez who made her PEC debut in the Mazda 2 Skyactiv. Another highlight for this year’s 8 Oras ng Pilipinas were the international entries. They represented Australia for SmartFuels2Race, Japan for Motul – 602PTG, and Singapore in the #9 BRP Racing Toyota Corolla. The green #25 Centrum Fuel - GT Radial car held onto the lead for several hours and looked to be on route to repeat its 2015 victory. But with a strong pace and careful planning, the #6 TRS Formula V1 of Mike Tuason, Ferdie Ong, Bjorn Ongtiaobok, Loius Ramirez, and Luis Gono moved up to 1st place overall with only 12 minutes to go. After 8 hours of racing, it would cross the finish line to win on its debut. Emerson Ocampo and Migui Briones in the #25 car fought well to eventually claim 2nd overall and 1st in RP class. 3rd overall and 2nd in RP was the #19 Team Shell Helix - Big Chill of Peewee Mendiola, Paolo Santos, Dax Santiano, and Milo Rivera. Behind them was last year’s winner the yellow #1 Centrum Fuel - GT Radial car of Mikko Briones and Daryl Flores. PartsPro Racing snatched 1st in FM-1 from the #14 Team Cebu Honda Civic in the closing stages. This gave Tyson Sy, Stefano Marcelo, and father-and-son Carlos and Iñigo Anton the class victory by completing 186 laps. George Apacible, Stefan Ramirez, Enrique Hormillo, Francis Aguila, and Sung Joon Park were 3rd in the #17 BMW AutoPerformance M3. FM-2’s podium was a clean sweep by Team Cebu led by the #14 machine. They were trailed by their #13 Toyota Vios Cup Car of Markku Suarez, Brian Currie, Norris See, and Dr. Clive Fermin who also collected 1st place in FM-3. The #30 KYB SmartFuels Toyota Yaris of Steve Travers, Sherwin Bargos, and Jack Saquilayan ended up winning the Manufacturer’s Cup. 30 out of the 31 starters made it to the checkered flag with all entries covering the full race distance on just one set of GT Radial SX2 tires.